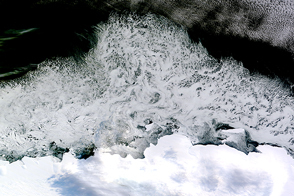 Enough ice lines the coasts of Sweden (left) and Finland (right) in this natural-color image that it is difficult to tell where the coast ends and the sea begins. 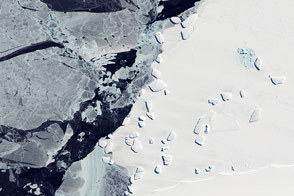 The sea ice envelops the islands that line this part of the coast, joining them to the shore. Only the sheltered water near Stockholm is partly free of ice. 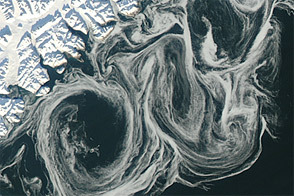 Dark water contrasts with the surrounding field of white snow and ice. Away from the coast, the Baltic Sea is sprinkled with bits of sea ice. 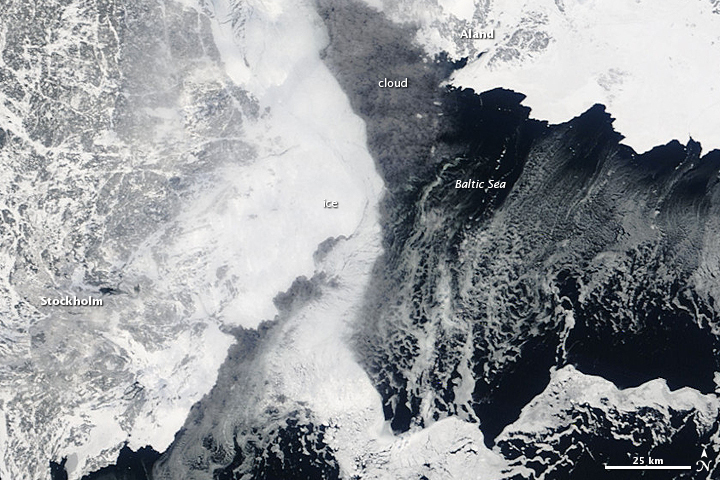 A thin layer of clouds stretches over part of the scene, but the brighter ice is still visible beneath the clouds. The Moderate Resolution Imaging Spectroradiometer (MODIS) on NASA’s Terra satellite captured this true-color image on March 5, 2010. The previous day, three ferries traveling from Stockholm to Finland were trapped trying to maneuver through the ice, said news reports. Carrying about 1,000 passengers each, two of the ferries collided with each other while trying to avoid the ice, but no one was injured, reported the Helsinki Times. An icebreaker freed the ferries, which were back in port by the time this image was acquired on March 5. The southern Baltic had been unusually cold, and winds pushed the ice into the Swedish coast, causing problems for ships outside of Stockholm and near ports farther north, including Sundsvall. 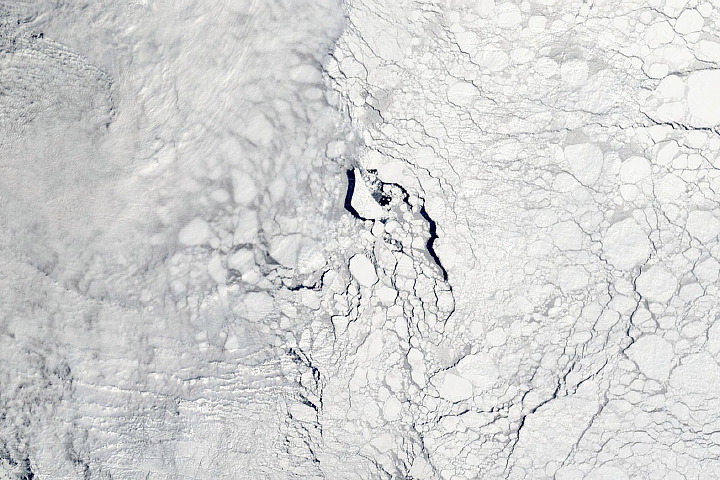 The worst of the ice was between Stockholm and the Finnish island of Aland, reported CNN. Daily images of the Baltic Sea are available from the MODIS Rapid Response System. NASA image courtesy the MODIS Rapid Response Team at NASA GSFC. Caption by Holli Riebeek. 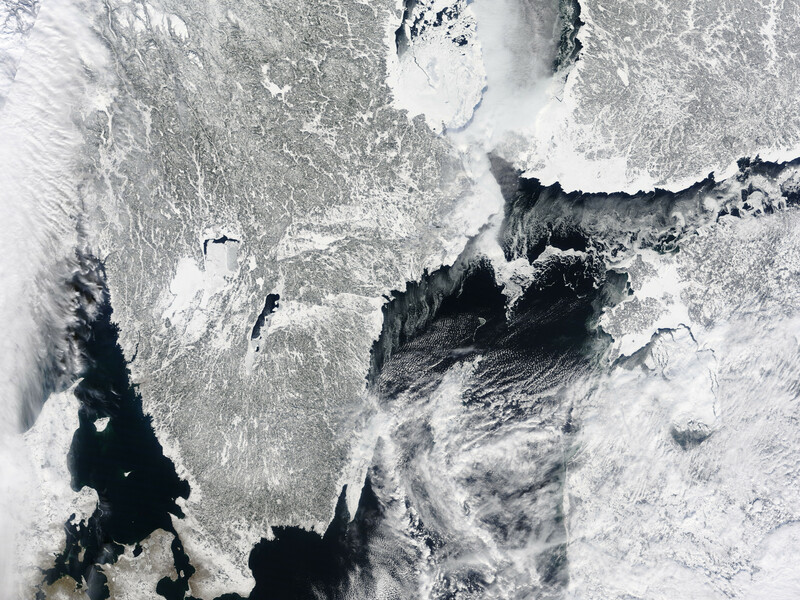 Enough ice lines the coasts of Sweden and Finland in this natural-color image from March 5, 2010, that it is difficult to tell where the coast ends and the sea begins. Thick ice stranded dozens of ships in the Baltic Sea in late February and early March 2010. Halasz, S. (2010, March 5). Ferries freed from ice off Swedish coast. CNN. Accessed March 5, 2010. Helsinki Times. (2010, March 5). Three Finnish ferries collide off Stockholm. Accessed March 5, 2010. Larson, N. (2010, March 5). Danger lurks as ships freed from Baltic ice. AFP News. Accessed March 5, 2010.